Quinoa, a healthful grain, is easy to cook and has a very pleasing texture. Make this healthy salad, including brilliant orange persimmon and beautiful red pomegranate for your next meal alongside a roasted chicken or turkey. 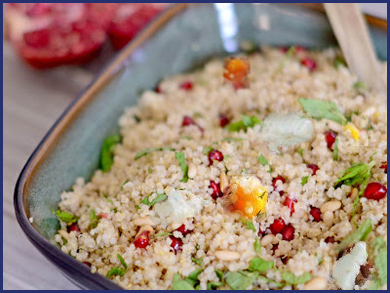 To make the salad: Pour the quinoa into a bowl of cold water and wash it, rubbing between your hands. Drain and repeat until the water is clear. Bring the 4 cups broth and quinoa to a boil in a large saucepan. Stir once and cook, uncovered, over medium-high heat for about 10 minutes, or until the liquid is absorbed. Transfer to a large bowl. Let cool. Add the persimmons and pomegranate seeds to the quinoa. Mix with a fork to keep the quinoa nice and fluffy. Lastly, add the parsley and chives. Chill for at least 2 hours. Remove from refrigeration 15 minutes before serving. We prefer to add the dressing just before serving so that the flavors are fresh. In a medium bowl, whisk together the lemon juice, pomegranate juice, and mustard. Add the olive oil, whisking until incorporated. Pour the dressing over the salad and mix with a fork. Carefully add the feta cheese. Enjoy!